For sheer beauty, few volcanoes can match the symmetrical cone of Mayon as it rises almost directly out of the Gulf of Albay, not even mount Fuji itself. Indeed, the cone is considered the world’s most perfectly formed volcano for its symmetry ( David Lee, 2008). Added to that, a beautiful tropical setting, tranquil blue waters, verdant green vegetation, a picture of paradise. But the picture deceives. Mayon is a stratovolcano that has grown so large that the sheer mass of its edifice is a disaster waiting to happen and the warning signs are already there in the form of fractures along its western and eastern flanks. These structures on Mayon have the same geometry as the dominant tectonic faults found within the Bicol Basin, a small sedimentary basin where Mayon is located. The physical facts are that Mayon rises 2,463 m above sea level with a prominence of 2,447 m, which means its edifice begins a scant 16 metres above sea level. 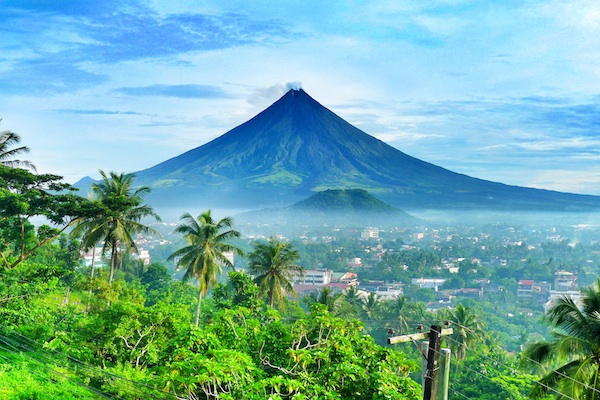 With a base measuring 17 by 17½ km in diameter, Mayon has a conical volume of 189 km3 (approximation, the real value is somewhat less as it does not have an even inclination, probably somewhere around 160 km3) The basaltic-andesitic edifice, built by successive basaltic pyroclastic deposits and andesitic lava flows, has an unusually steep inclination towards the summit, 35-40 degrees on the upper slopes, and is capped by a small summit crater 200 m in diameter which is breached in the direction of the City of Legazpi to the south-southeast. It is located on the eastern side of Luzon near the Philippine Trench, which is the convergent boundary where the Philippine Sea Plate is driven under the Philippine Mobile Belt. The first record of a major eruption being witnessed was in February 1616 by Dutch explorer Joris van Spilbergen, who recorded it on his log in his circumnavigation trip around the world. The first eruption of which there is an extended account was the six-day event that began on July 20th 1766. In all, there is a record of at least 49 eruption with the to date most devastating one being the February 1st 1814 tragedy (VEI 4) that according to a recent PHIVOLCS estimate claimed about 1,200 lives. 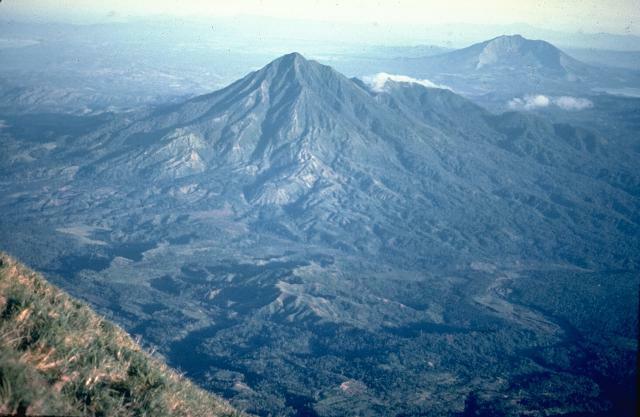 The eruption, classified by PHIVOLCS as “Plinian”, engulfed and destroyed most villages of the Albay and Camarines province. According to accounts, “hot stones, sand, and ashes flowed from the crater, killing thousands of terrified inhabitants including those who were trapped inside the Cagsawa Church”. The eruption that began on June 23rd, 1897, (VEI 4, PHIVOLCS classification “Vulcanian, strong”) lasted seven days without interruption. “Fire literally rained over the nearby villages including Bacacay, Libon, and San Roque. The catastrophe killed hundreds of people who were either trapped by flowing lava or hit by hot rocks and steam” (i.e. lava bombs, lava flows and pyroclastic flows). The longest lasting eruption was that of 1881. It began on July 6th 1881, and lasted until approximately August 1882. This eruption began with strombolian explosions after which basaltic-andesitic lava was erupted effusively, the latter much like Mt Sinabung in Sumatra currently. 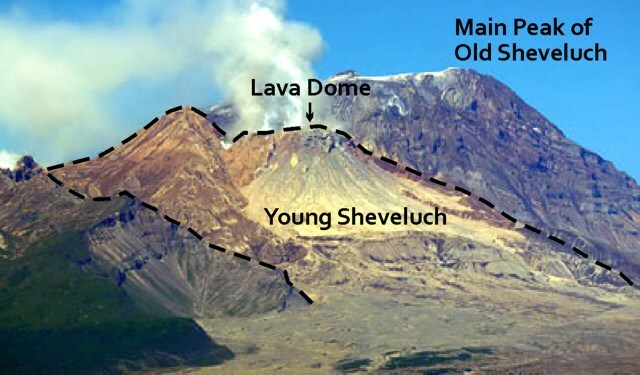 The 1984 eruption was strombolian-vulcanian with pyroclastic flows. On the recommendation of PHIVOLCS, some 75,000 people were evacuated from the declared danger zone and there were no casualties. In 1993, 75 people, mainly farmers, were killed by pyroclastic flows. In 2006, nearly 40,000 people were evacuated from the established 8-kilometre danger zone on the southeast flank of the volcano. Since then, Mayon has suffered a minor summit explosion in 2008 (July 10th) and again in 2009 (November 11th). The latter was followed by another explosion on December 17th which was followed by a minor extrusion of lava. As very high levels of sulphur emissions were recorded, 8,993 tons per day at the peak of the crisis, a major eruption was feared but failed to materialise. Almost 45,000 people had at one time been evacuated but were gradually allowed to return home as the danger abated and on January 10th, 2010, PHIVOLCS lowered the alert level saying there was a low likelihood of a hazardous eruption. On May 7th 2013, the volcano suffered a sudden phreatic explosion at the summit which killed five climbers and in August 2014 a new 30-50m high lava dome was extruded. Since then, there has been an increase in ground deformation and a series of earthquake crises. Another danger with Mayon are its lahars. Torrential rain can remobilise ash months and even years after an eruption and there have been several deadly events in the past. In October 1766, months after the July eruption of that year, heavy rainfall in conjunction with a violent typhoon carried down disintegrated fragmental ejecta, burying plantations and whole villages. In 1825, the event was repeated in Cagsawa and some 1,500 people were killed. Following the effusive eruption of July 2006, rainfall from Typhoon Durian resulted in lahars that killed at least 1,266 people on November 30th. The precise figure may never be known since many people were buried under the mudslides. A large portion of Padang, an outer suburb of Legazpi City, was covered in mud up to the rooftops. From the historical record, it would seem that with PHIVOLCS well on top of their volcano, closely monitoring it, the greatest danger comes from sudden lahars caused by torrential rainfall. The historical eruptions of the past 400 years shows a cyclical activity beginning with explosive basaltic eruptions, followed by longer term effusive andesitic lava flows. Eruptions range from strombolian to (sub?) plinian eruptions, typically VEI 3 but occasionally as high as VEI 4, accompanied by pyroclastic flows with each cycle seemingly terminated by an effusive eruption. As long as PHIVOLCS continue their excellent monitoring and Philippine authorities and population respond as appropriately as they hitherto have, there should be little concern for an impending major disaster. There is however, the disturbing report of fractures appearing on its Western and Eastern slopes (Lagmay, Tengonciang & Uy, 2004), fractures that align with known tectonic fault lines. With such a large and very steep edifice there is an appreciable risk of a catastrophic flank collapse as well as a lateral blast such at the one at Mt St Helens 1980. Bulkang Mayon is located at the very heart of the province of Albay with a population of 1,233,432 people according to the 2010 census. Today, the volcano is geographically shared by eight municipalities counting clockwise from the North; Tabaco, Malilipot, Santo Domingo, Legazpi, Daraga, Camalig, Guinobatan and Ligao. The City of Ligao is farthest from the peak of Mayon, some 15 kilometres as the crow flies. The rest are literally at the feet of the volcano, almost equidistant at 10 km from the peak. To the WNW of Ligao are the municipalities Oas, Polangui and Libon with the latter a relatively comfortable 27 km away. To the north lies Malinao, 16 km distant, to the east Bacacay about 21 km away and Manito to the south-east across the Gulf of Albay 27 km from the peak of Mayon. These municipalities are named for the main city and the distances given are as measured from the city centre to the peak of Mayon volcano. With the exception of the eastern tip of Rapu-Rapu Island, there is no point in Albay province outside 50 km from this volcano and those with a good memory may recall that Mount St Helens May 1980 eruption caused fatalities as far away as 21 km and that rocks were hurled with enough force to penetrate the bodywork of automobiles up to 50 km away in certain directions. 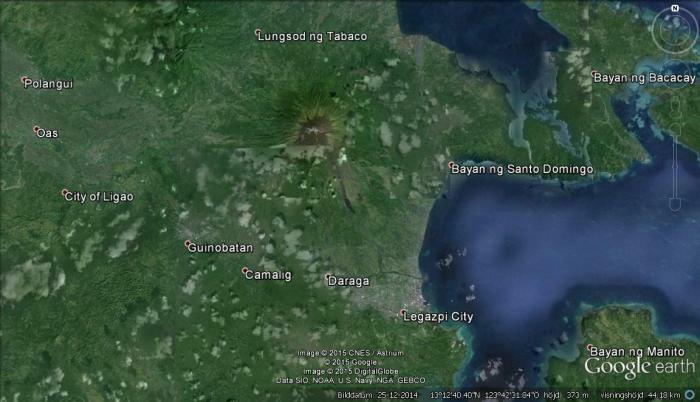 Google Earth map of Albay showing some, but not all of the municipalities around Mayon. Located about 10 km from the peak are Tabaco (125,083 inhabitants according to the 2010 census), Malilipot (35,567), Santo Domingo (32,414), Legazpi (182,201), Daraga (115,804), Camalig (63,585), Guinobatan (75,967), Ligao (104,914) and Malinao (42,770). Farther away at between 15 and 27 km are Oas (64,785), Polangui (82,307), Libon (71,527), Bacacay (65,724) and Manito (22,819). If we define the inner risk zone as being within 20 km from the peak, this includes the eight municipalities sharing the volcano plus Malinao to the north with a combined population of 778,305 people as of the 2010 census. As long as the volcano follows the established pattern of eruptions, current hazard mitigation measures are sufficient. The problem is that if instead of a summit eruption, a period of inflation leads to a sudden, explosive eruption at one of the fissures on the volcano’s flanks or beyond. 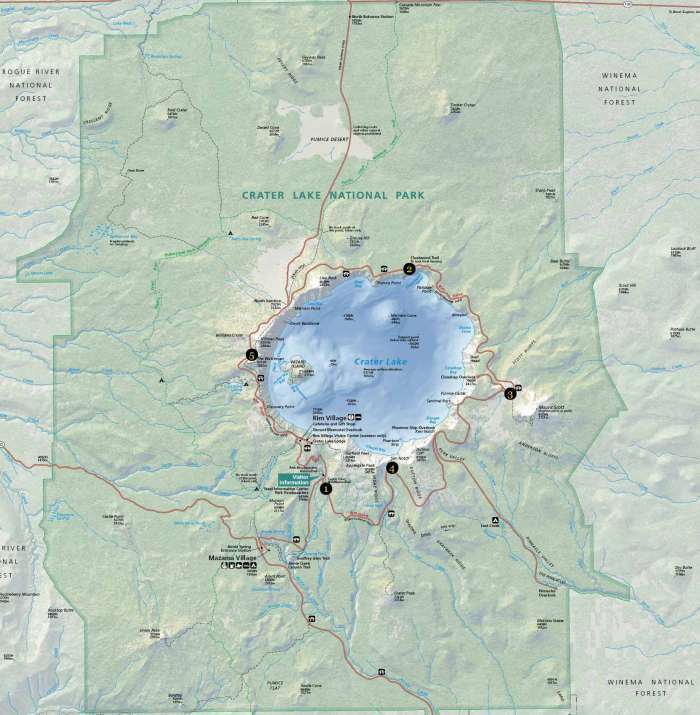 To judge from the demise of the not dissimilar Mount Mazama, in this case the eruption would occur inside one of the municipalities and be much larger. How much larger is hard to predict but a ballpark figure would be somewhere between St Helens 1980 eruption and that of Pinatubo in 1991. If closer to the latter, the pyroclastic flows could travel well over 20 km from the point of such an eruption. If such an eruption was to occur, one can hope that there would be clear signs well in advance such as precursor phreatic eruptions that while they still could cause thousands of deaths, would give an indication to order large-scale evacuations of more than half a million people from the area threatened. It is now time to take stock of the salient facts. First, the eruptive cycles of Mayon are characterised as explosive basaltic eruptions followed by later effusive andesitic ones. The eruption of 1814 is characterised as VEI 4 plinian, that of 1897 as VEI 4 vulcanian (strong) whereas the other explosive eruptions are classified from strombolian to vulcanian and range from VEI 2 to VEI 3. As Mayon erupts frequently and has produced basaltic plinian eruptions, it has a prodigous and continuous supply of juvenile magma. For comparison one can look at Tarawera in New Zealand, another volcano known to have produced a plinian basaltic eruption albeit one substantially larger at VEI 5. Tarawera is part of the Taupo Volcanic Zone which produced a VEI 7 around 180AD (Hatepe eruption) and a VEI 8 some 26,500 BP (Oruanui eruption). Not that Mayon is anywhere near likely to produce such a large eruption, even if it has a very large rate of influx of magma. Second, Mayon stands on a sedimentary basin, a feature it shares with the Campanian region of Italy (Roccamonfina, Campi Flegrei, Ischia, Vesuvius where the average thickness of the sedimentary layer is ten kilometres). There are three implications that arise from this fact: The resulting eruptions will be far more explosive because of the water content. There is a ready supply of water-rich sediments that can relatively easily and quickly be metamorphosed into more evolved magmas. The underlying structure may be weaker and not able to carry such a large volcanic edifice above should the main magma chamber grow very large. Third, Mayon is in a tropical climate with the associated heavy annual rainfall this brings. Typhoons strike well-nigh yearly and have already resulted in fatal lahars. In addition, the edifice of Mayon rises on land so low that effectively, the volcano rises out of the sea. All these factors means that the ground is saturated with water and as a consequence, the risk of phreatic or phreatomagmatic explosions increases. Fourth, Mayon stands on at least three identified faults or lineaments. Coupled to the overlarge and over-inclined edifice, there is a not inconsiderable risk of either an eruption or a major earthquake initiating a catastrophic flank collapse. Fifth. The recently identified fractures to the WNW and E, on and beyond the flanks of the volcano further increase the risk of such a flank collapse. Furthermore, the cracks provide easy access for large amounts of water to penetrate the flanks which further increases this risk as well as the risks for major eruptions from a new conduit opening up along such a crack. Sixth. Because of the unusually symmetrical cone, it is impossible to predict which sides of the volcano and hence which communities which are at most risk from pyroclastic flows and lahars. Even the threat of a repeat of the 1814 eruption would probably mean that in excess of half a million people would have to be evacuated. Seventh. All around the flanks of Mayon are prehistoric cinder cones such as Lignon Hill in Legazpi City (population 182,201), home of the PHIVOLCS observatory, Kawa-Kawa Hill immediately southeast of the City of Ligao (104,914) as well as the larger Mount Bulakawan southwest of Malilipot (35,567) and the “extinct” stratovolcano Mount Masaraga overlooking Tabaco City (125,083) with its peak some 11 km from the summit of Mayon. These are proof that in the past, there has been major volcanic eruptions literally within or just outside the cities surrounding Mayon. While it is very difficult to predict if and when and how one or more of these factors combine, four devastating scenarios emerge where at the very least hundreds of thousands of people may be at risk. At present, their best protection is the continued excellence of the monitoring provided by PHIVOLCS and the continued smooth cooperation between them, the civic authorities and population. Should one of these three legs fail for whatever reason, the result could indeed be a very great tragedy that could equal or even exceed the December 26th 2004 Indian Ocean Tsunami disaster. Provided timely and accurate warning was given and heeded as well as the logistics of housing in excess of half a million evacuees for an extended and indeterminate period could be undertaken, the death toll from such an eruption would be “tolerably small”. Unfortunately it would still be considerable. The main problem is the time needed to evacuate such a great number of people which would require it to begin well in advance of any clear indication that a large eruption was imminent. But there is no way to prevent the inevitable economic disaster resulting from such an eruption. On the other hand, should such an eruption come as a complete surprise, the casualties would probably number in excess of 100,000 and possibly over a quarter million. This could be the result of a misinterpretation of the available data or if for some reason such as another natural disaster, the monitoring breaks down at a critical juncture. The vital importance of continued monitoring of the highest standard as well as further studies of this volcano cannot be overstated. As has been previously stated, this could be initiated by either a purely tectonic event or an eruption. In some ways, an eruption-induced flank collapse would be preferable as then, there would be clear signs in advance and at least part of the population at risk would have been evacuated. With an earthquake-induced flank collapse, even one which is not followed by an eruption, there would be no chance for the people in its path. It would be entirely down to chance what the casualty figure in such a case would end up being. With “luck”, only smaller communities would be affected and the death toll would end up in the tens of thousands instead of the possible hundred thousand plus in the worst case (cf Mt Shasta), a quarter of a million. Because of the presence of fractures on the WNW and E flanks, one of these should be the most likely to give way. In the former case, the municipalities of Ligao (West, 104,914) and Tabaco (NW, 125,083) are most at risk whereas in the latter case, it is Santo Domingo (E, 32,414) even if Legazpi (SSE, 182,201) could be under threat as well. Should it be a question on an eruption-generated flank collapse followed by a lateral blast, most of the communities at risk from pyroclastic flows should have been evacuated. Here it is a question of how large an eruption PHIVOLCS had predicted and what communities they would have recommended be evacuated. If a relatively speaking smaller eruption had been predicted, there is alas every chance that the evacuation zone had not been extended to include the communities at risk. The effects of a lateral blast in this case would extend beyond, but not excessively far beyond the damage caused by the collapsing flank. But if the eruption turns out to be as large as the 1814 eruption and the WNW flank is the one that collapses, not only will Ligao and Tabaco be at risk but also Oas (64,785), Polangui (82,307) and Libon (27 km distant, 71,527) would be at extreme to very high risk. In this case, and provided the communities within 15 km have been fully evacuated, at least a quarter of a million people would be in great danger. 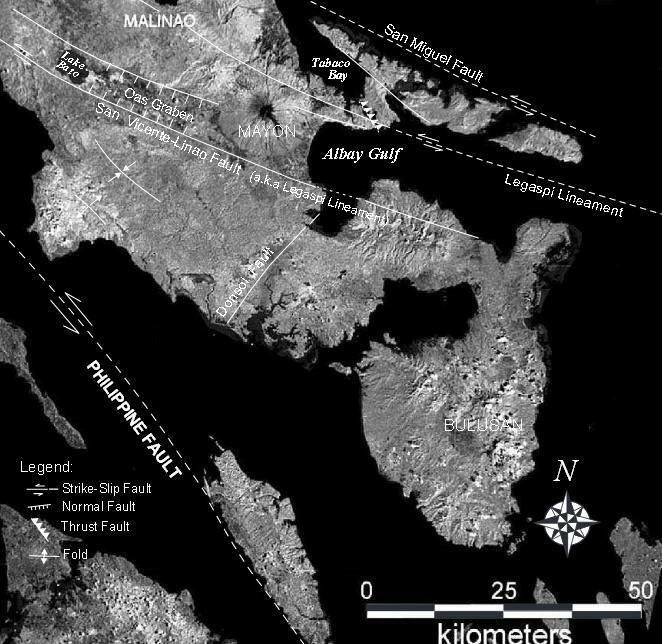 The most powerful eruption of the last century occurred in 1912 when the Katmai volcano had a VEI 6 eruption through a flank vent now known as Novarupta some 10½ km away, after which the summit of the Katmai volcano collapsed to form a 3 by 4 km wide and 600 m deep (summit) caldera. The 60-hour-long eruption expelled 13 to 15 cubic kilometres of ash and pumice which covered an entire valley afterwards known as “The Valley of 10,000 Smokes”. 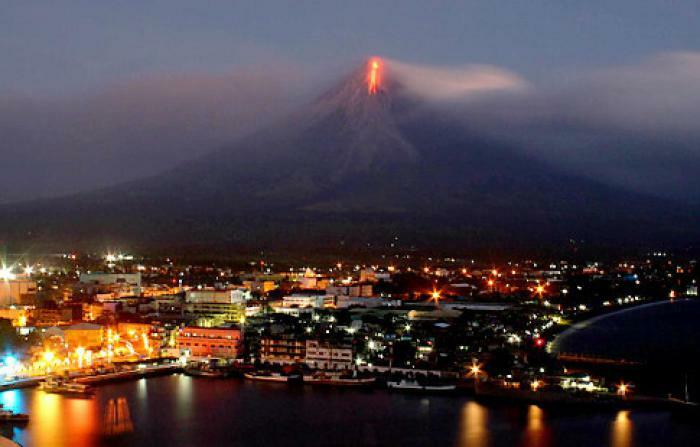 Could Mayon suffer a similar eruption? Although unlikely, it is not altogether inconceivable as both the rate of influx of fresh magma and geologic setting in a sedimentary basin would allow for the build-up of evolved magmas, something the effusive andesitic eruptions of Mayon hints at. Furthermore, the presence of both stratovolcanoes and cinder cones about 10 km distant prove that this has happened before. In addition, faults that intersect the edifice of Mayon as well as the systems of fractures on its WNW and E flanks provide ready-made dikes or weaknesses through which such evolved magmas could erupt explosively. It has happened before. The 1,328 m (a.s.l.) high Mount Masaraga stratovolcano stands a mere 11 km from the summit of Mayon and is comparable to Vesuvius in size (elevation;1,281 m). It is considered to be “extinct” as the GVP is “not aware of any eruptions within the Holocene”. The VORGRIPA register is equally unaware of any eruption of VEI-4 or greater prior to this and PHIVOLCS does not list it amongst the potentially active volcanoes. In the background lies another stratovolcano, Mt Iriga, which clearly has suffered a flank collapse followed by the growth of a lava dome. Were Mayon to suffer such a flank eruption, even one an order of magnitude less (VEI 5), the result could be horrendous unless almost the entire province of Albay had been evacuated in advance. As was remarked earlier, with the exception of the eastern tip of Rapu-Rapu Island, there is no point in Albay province outside 50 km as measured from Mayon’s summit. The flank vent would literally open up in the middle of one of the municipalities and the base surge and pyroclastic flows from such a large eruption could easily travel 20 – 30 km in most directions except possibly the one directly opposite where the bulk of Mayon would offer some degree of protection. 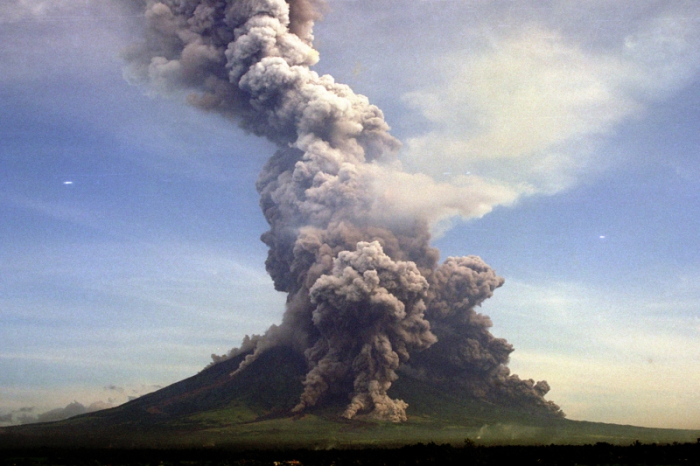 Should pyroclastic flows enter the Gulf of Albay, it is hard to see how they could fail to travel across it as pyroclastic flows notoriously pick up speed and travel greater distances over water – on a friction-reducing cushion of steam as it were. From an eruption such as this there would be secondary and tertiary effects. Even people who survive the immediate eruption would have ingested enough volcanic ash, shards of glass, to cause severe and in many cases fatal respiratory complications. Water supplies would be poisoned by both volcanic products and the untold number of decomposing bodies, animal as well as human. In such an environment, epidemic diseases could spread like wildfire and kill, not only the survivors of Albay, but also those initially not affected directly by the eruption. Eventually, one of two fates will overtake every large stratovolcano. Either its magma supply runs out permanently, it becomes extinct and geologically speaking quickly erodes away. Or it undergoes an eruption large enough to cause the main edifice to collapse into an emptying magma reservoir to form a very large circular depression that over time fills to become a crater lake. In many ways, Mayon resembles Mount Mazama, the progenitor of the most famous crater lake of them all, Crater Lake in Oregon. Like Mayon, Mount Mazama erupted basalts and andesites prior to the cataclysmic events that led to its destruction. The demise of Mount Mazama in a cataclysmic eruption about 7,700 years BP is well studied and much is known of the volcano prior to its catastrophic eruption unlike Mayon, where the tropical climate and growth rapidly hides such deposits as remarked upon in their 2004 report by the discoverers of the fractures; Lagmay, Tengonciang & Uy. From a comparison with Mount Shasta at the point where its diameter equals the rim around Crater Lake, Shasta rises another 2,100 m. When the fact that the remaining slopes of Mazama are far less greatly inclined than those of Shasta, estimates are that Mazama would have risen another 1,600 – 1,800 m or thereabouts which places the total prominence of Mount Mazama at about 2,500 to 2,700 m, only slightly greater than that of Mayon (just under 2,447 m). However, if Mayon has a magma reservoir slightly higher or slightly wider than Mazama had, the load-carrying capacity of Mayon’s base may be slightly less and thus offset the lesser volume of the edifice, especially if one considers the geological setting in a sedimentary basin. Both the recently discovered fractures as well as the cinder cones and stratovolcanic edifices at about 10 km distance indicate that this may be the case. The demise of Mazama was relatively rapid. About 7,900 BP, there was a large, explosive eruption from a vent that opened up along one such crack to create the dacitic Lao Rock and the northern crest of the rim to Cloud Cap. This eruption was accompanied by very large eruptions of pumice, which was spread for 32 km or more across the adjacent country. The explosive activity of this phase of Mount Mazama culminated in the eruption of the peculiar dark pumice, rich in hornblende, which followed the outflow of the tuffaceous dacite. Two centuries later came the cataclysmic, caldera-forming eruption. The magma reservoir eventually emptied to such an extent that some 70 cubic kilometres of edifice collapsed into the emptied reservoir, meaning that this volume was erupted as tuff-forming ignimbrites, pyroclastic flows, that spread in all directions for over 32 km as measured from the remaining rim. The effect of such devastating tuff-forming pyroclastic flows in a demographic setting such as that of Mayon need not be elaborated. Suffice to say that with the ocean adjacent, there is a not inconsiderable possibility that the ocean might breach the remaining walls and enter the breeched magma reservoir resulting in even greater explosive eruptions such as happened at Thera or Krakatau. Before we get too carried away, it is worthwhile to note that Mount Mazama is considered to have had a repose period of about 20,000 years before the series of events that led to its geologically speaking rapid destruction. But with volcanoes nothing is certain and it is not utterly inconceivable that Mayon could initiate this sequence of events without a preceding period of repose or even that such a period of repose now lies in the past. But it would take a series of extremely unfortunate circumstances without PHIVOLCS identifying the threat arising from the first indications of precursor eruptions and the Philippine authorities not to react to their warnings in good time. And once such a precursor eruption has occurred, the possibly century to centuries long fuse to the cataclysmic caldera-forming eruption that would utterly devastate the entire province of Albay will, one fervently hopes, have led to its evacuation and abandonment well in advance. If not, Mayon certainly meets the 1 MDE criteria without even having to consider secondary and tertiary effects of such an eruption. PS. The next post in the series will be up on Friday, June 19th. In between there may be a guest post.